The formula to starting the day off right: a tasty breakfast. Some may call me picky because I have some requirements: no cereal from a box (which makes me hungrier than I started an hour later), and certainly no roll or pastry from a street cart. I'd rather eat the previous day's leftovers for breakfast. If you sit next to me at the office, be prepared for the smells of leftover curry or meatloaf and mashed potatoes or Thai noodles bright and early in the morning. Yes, I'm also the type who never wonders if it's too early for chocolate. So if this is how I eat during the week, you can imagine my ideal meals for the weekend. Enter the Dutch baby, which I think of as the extroverted sister of the pancake. Poor pancake, she aims to please when artfully arranged in high stacks, but then here comes the Dutch baby with her upturned edges and powdered sugar sprinkles. Baby gets all the oohs and aahs every time. Growing up we'd go to a particular pancake house that specialized in these. So I was pretty pleased when I discovered that you can make this very easily. And with a blender it goes even faster and is less of a hassle. Sorry, pancake. 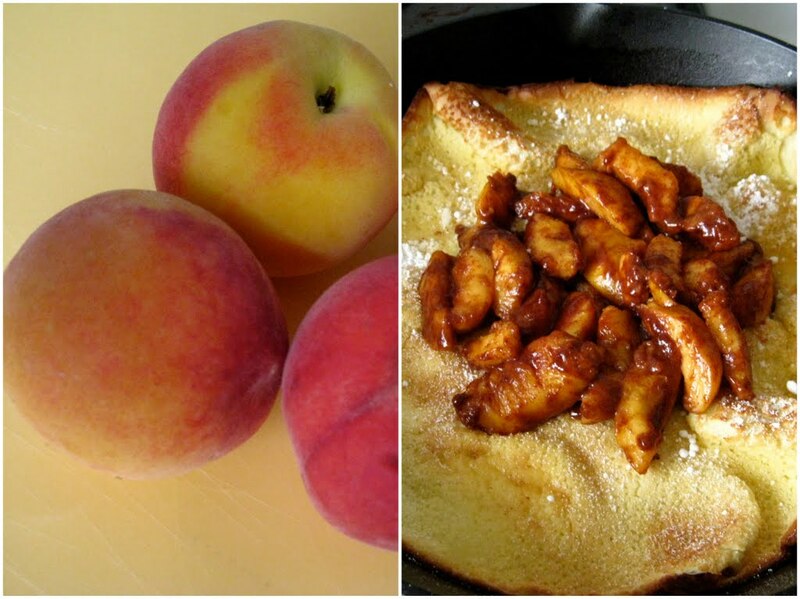 For this recipe, I used peaches but apples, plums or berries should work just as well. 1. Preheat oven to 425°F. In a medium cast-iron skillet, melt butter over medium heat; set aside. 2. In a blender, combine eggs, milk, flour, salt, vanilla, and 1/4 cup sugar. Blend until foamy, about 1 minute. Pour batter into skillet; bake until pancake is puffed and lightly browned, about 20 minutes. 3. Make spiced fruit topping: Add fruit, cinnamon and brown sugar to pan. Cook until heated through and softened. 4. When pancake is finished, dot with 1 tablespoon butter, and sprinkle with confectioners sugar and lemon juice. 5. Slice into wedges, and serve immediately. This looks really good. I am in the search of a good dutch baby recipe. I think I am going to try with my apples. Thanks for the recipe.